A love for lamb is one thing I share with Brandon. Our SM Aura food tripping (in previous posts) was capped by a Greeka Kouzina dinner. 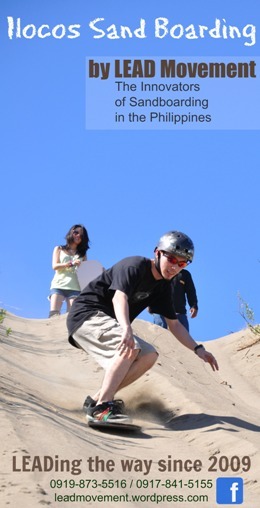 I’ve already done an overview (here). It’s time to do a review on another Greek restaurant. I went to Cyma Greek Taverna at Robinsons Magnolia while waiting for my bus to Laoag. 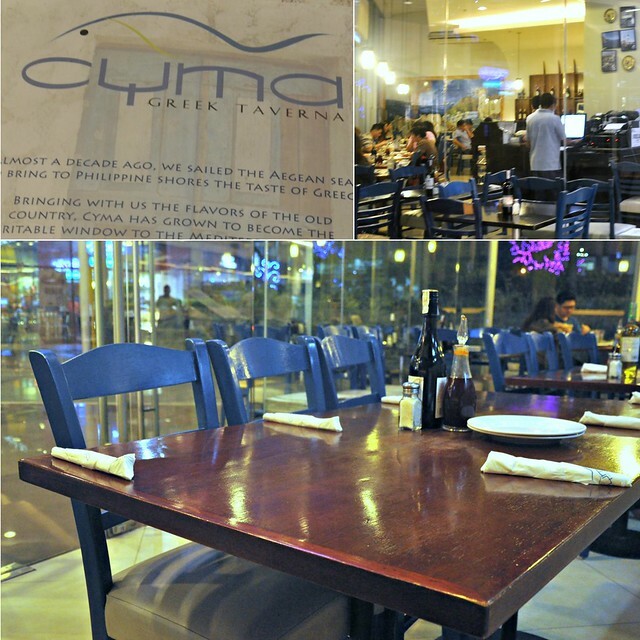 Cyma was developed by awarded chef Chef Robby Goco. He is also the same chef behind the cuisine of Comedor in Vigan’s Hotel Luna. The Cyma menu is a blend of classic Mediterranean flavors and contemporary Greek dishes, which include seafood, lots of lamb and other meats (like moussaka, baby back ribs, brizola, pastisado, burgers topped with herbed feta) flamed cheese, vegetables, some pastas and a wide choice of sides. Just a curious point, because I am Ilocano, distinctive Greek cooking is comparable to Ilocano cooking, which can be described in one word, and that’s frugal. But refined is the better word to me. I can’t help but compare the olive oil and herbs of Greece to the Ilocos region’s most basic fish sauce, vinegar, and garlic or red onions. 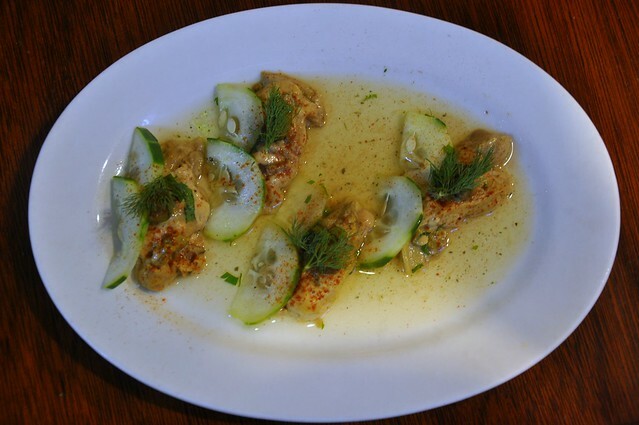 My dinner starts with a meze (appetizer) of ahino salata, raw sea urchin (uni in Japanese and maritangtang in Iloko), with cucumber and capers drenching in parsley mint vinaigrette. 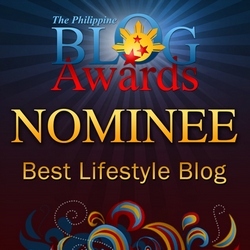 The lively flavorscape is enough to make me bounce back from a hectic 3-day work. 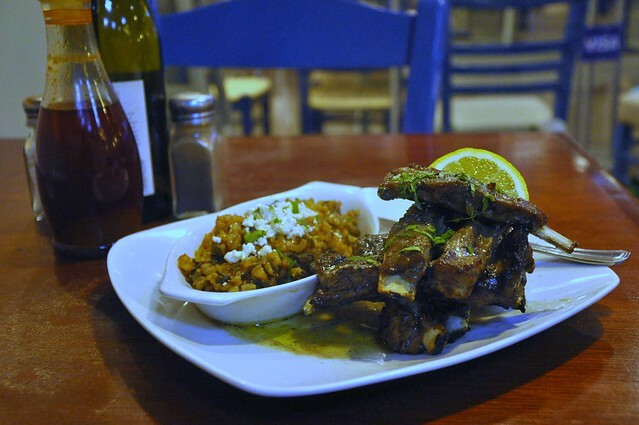 Now my main event — paidakia, or char-grilled lamb ribs — to my tasting, flawlessly herbed and spiced, and spanakorizo, which is spinach rice topped with feta, and better with lemon squeeze. Behind the uncontrived, rather folksy ambiance and friendly staff, it’s the quality of food that stands out, and that is what counts when you are eating out. Pricing is not cheap. 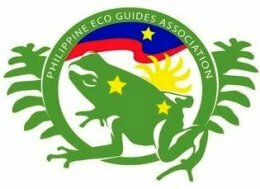 Maybe you will have to shell out a thousand pesos or more for a full dinner. Planning to bring Brandon to Cyma next week.